« Beware Of The Goat. It’s odd when the lake freezes. It loses its reflections and depth and looks like any old snow-covered flat surface, and all of a sudden everyone is walking across it instead of around the edge. The other day a skier zoomed down the hill, started across the lake, and disappeared. The one who had seen the incident called the emergency services. A helicopter came; from my living room window I saw it going downwards, lights flashing, and then hovering a few metres over the lake surface. But it was all a mistake; no one had fallen through the ice. There was no skier, except in the imagination of the caller. but even at midday the sun is quite low and the shadows long. The gate to the dog run is chained shut and padlocked. Poor old Topsy and the other dogs can’t understand why they aren’t allowed in, nor can the owners. I know where there’s a hole in the fence. Besides, we could get in simply by walking over the lake. Nobody does, though. Not so far. We might try tomorrow. “The gate to the dog run is chained shut and padlocked.” Why? The last two photos are full of poetry. I hope I will be able to see Norway one day….. If not a skier, what was it that zoomed down the hill ? An avalanche ? A deer ? 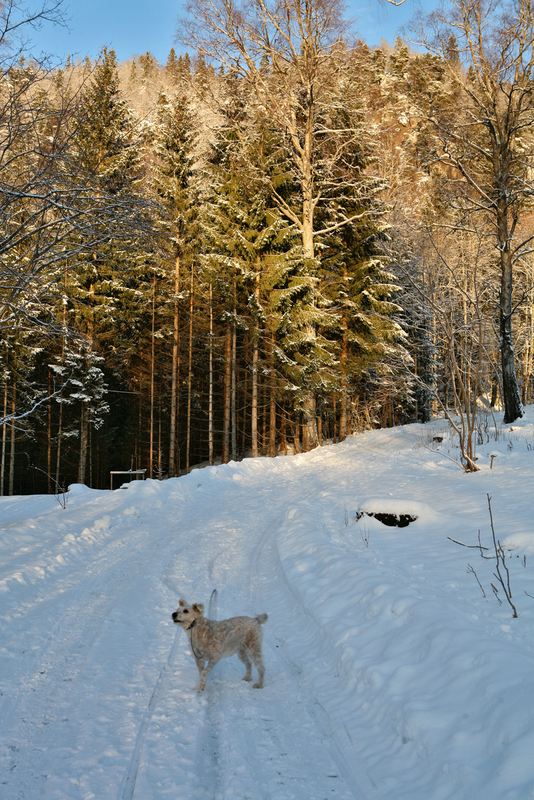 A dog with downhill skiing aspirations ? Pay attention. That must have been Crown’s Architecture, R&D Division, testing skis for goats. I get it. The original title “7476” of this post is the emergency services number. That third picture took my breath away. I’m so sick of streams of “favourites” and “outstandings” and all that sort of online photographical hierarchicalness being full of hyper-manipulated versions of what was once a beautiful scene. This is my antidote, with which I shall sooth eyes rasped by the overwrought. Sig, that’s very kind of you, and of course I hope you come here, but I would much rather be in Mauritius during our snowy season. My wife tells me (nothing much ever happens in Norway, so this incident was on the news) that the skier did exist, it was just that she or he disappeared into the mist or became invisible because they were wearing a white outfit. Something like that. It is a mystery why the dog gate is padlocked and chained. It does get very muddy in autumn and spring, but that’s no reason not to let us in during the winter. If I’d ever got around to paying the annual fee for using the dog-run, I would complain about the chain. I’m very glad you like it, rr. I agree about the manipulated pictures. I feel I’m exposed daily to so much schlock on the internet nowadays that it’s hard to see any picture with an unjaded eye. Once in a while they show interesting photographers in the Guardian’s photography section. I forgot to mention this, courtesy of Naked Capitalism. 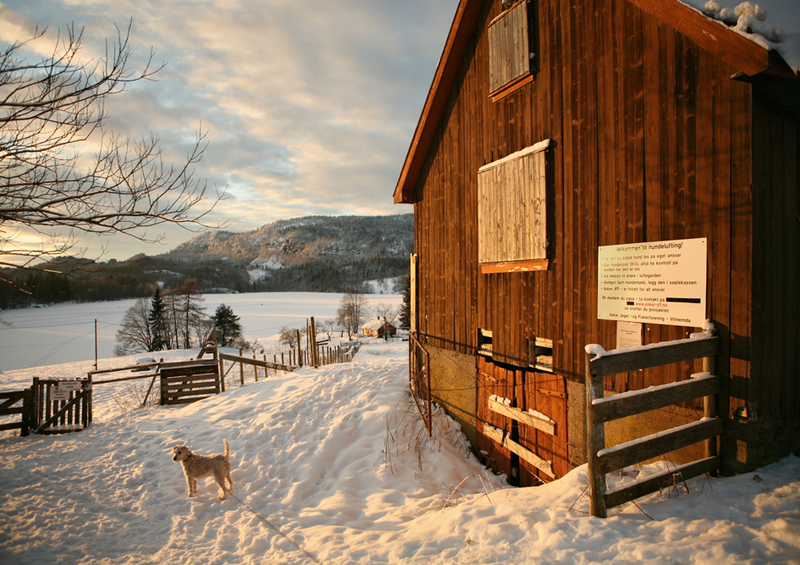 Oh, I LOVE that last photo with Tospy and the barn and the most perfectly captured northern winter light… just magnificent! Here we have also had a dreadful beginning-of-winter — two months of snow-rain-ice-slush-snow-rain-ice-slush. And then on Sunday we got a beautiful snowfall. Everyone who had been avoiding the park — because it was impossible to walk on rough, uneven, slick ice covered with water — came out. I’ve never seen so many dogs at one time in the park! I’m so glad your camera is fixed. Is Topsy the one in that beautiful last picture? Yes, that’s Topsy. I probably wouldn’t go out of the house during the winter if it weren’t for Tops. Thanks for the bears, dearie. I’ve been wondering what a bjørnhi looks like. There’s supposed to be one around here somewhere. mab, yes, exactly. We had that ice everywhere too; I slipped over several times. Thank goodness for the proper snow, and thank you for liking that picture! Another vote for picture number 3. Topsy-related material is always welcome too. Picture number 1 passes muster, so it’s a triumph for your camera, all in all. P.S. Aren’t Canadian voices attractive? Bears are certainly fond of Canadians. 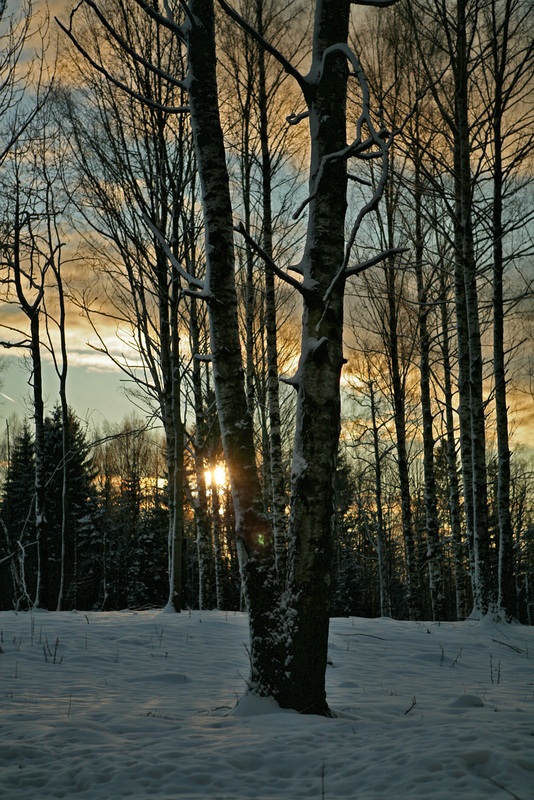 That winter sun through the trees is wonderful. As though someone hit “Enhance” in iPhoto. Fortunately I don’t see much “schlock” on the internet, because the internet is so rare and valuable I never click on or type in anything I don’t already strongly suspect is going to be GOOD. (Language Hat, A Bad Guide…you know who you are). Soon I have to leave the library. So you’ll be spared more fatuous comments. Catannea, you are very funny. I think that there is something wise to be said about the contrast between the high-speed flow of information on the internet and the slow wisdom of calligraphy, but I don’t have time to think it through right now. I think you’ve got it backwards, empty. On the internet there is only a high-speed flow of letters, so many that there is no time to interpret them. Such a flow is not effectively information, even though it is the current wisdom to call it that. A calligraphist pays attention to what he writes, producing it at a rate that enables interpretation and understanding. The latter yield information – but whether it is wise or not depends on more than the placement of the curlicues. There is no information where nothing is understood. I would like more crossings-out and ink blots in works of calligraphy; sometimes it seems a bit too precious. No mistakes is where calligraphy and Microsoft Word diverge from everyday life, and though it’s a good thing in the case of the internet not to be burdened with all the working-though of the writer’s ideas, with calligraphy I like to see signs of life (Japanese calligraphy & graffiti are good at this). ‘Calligraphist’, a bit like ‘trombonist’ or the Victorian ‘homosexualist’, sounds like an accusation. I had bad grades in English classes in primary school, because I refused to write longhand in that all-letters-rounded-the-same-way, illegible manner so beloved of my teachers. Girls always got A+ scores at that. That’s basically why I don’t like ’em. Callipygraphists are ok, though – like Hockney at certain periods. A+ in illegibility? I don’t think we were marked in that. Why do women have rounder handwriting than men? David Hockney has shapely buttocks? Or Peter Schlesinger? I was thinking more of Man Taking Shower in Beverly Hills. Well, I answered before you linked to the Schlesinger, which is more like callipigraphy. There’s no accounting for taste. You were right earlier, an ink blot over the face would have reduced the preciosity. No, I like yours much better. 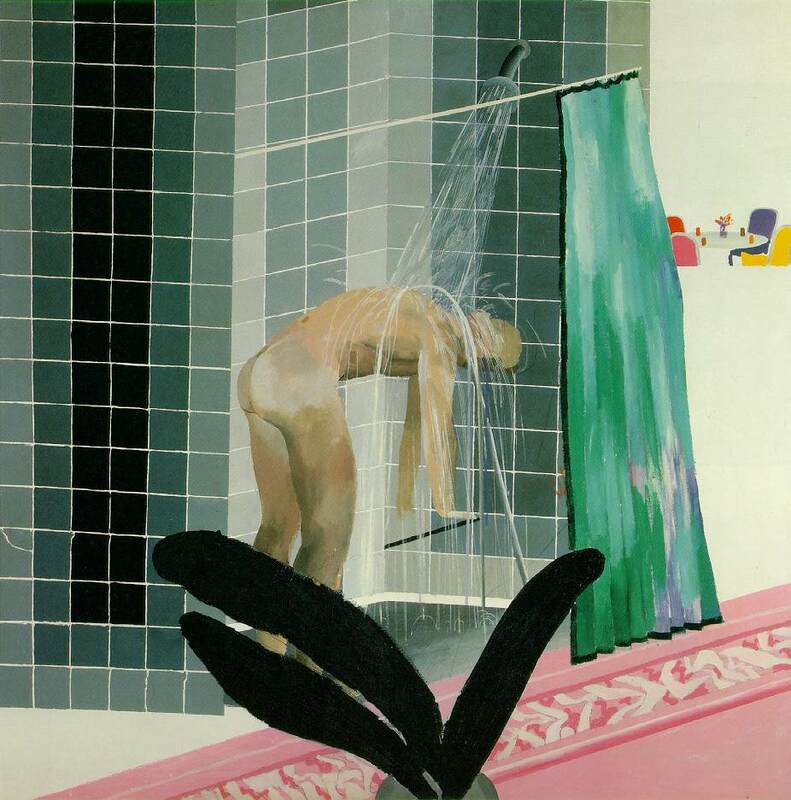 David Hockney is quite solemn in his writing and speaking, he usually comes off worst in comparisons to Alan Bennett (his gay blond Yorkshire contemporary), BUT some of his paintings (eg this one with its phallic cactus and cracked tile) are in their own way just as amusing as anything by Alan Bennett. Why do women have rounder handwriting than men? Because it is decorative and unnoticeably soigné, like well-applied makeup. That’s a brilliant painting, I love the water splashes and the very odd space that’s created by that tiled shower and the figure leaning on the glass shelf or whatever it is. I have always liked that shower painting. Not for the piggies, but because of the strange effects – like the shadowing of the shower curtain, which makes it appear to be hanging over a carpet-as-patterned-side-of-bathtub. Does round handwriting often accompany male homosexualism? Do lesbians usually write with a spiky hand? like the shadowing of the shower curtain, which makes it appear to be hanging over a carpet-as-patterned-side-of-bathtub. “Feminine” homosexuals probably write like that. Lesbians don’t write, they shout. But what do I know about such things. My own handwriting is butch, spikey and hard even for me to read. That’s the closest I could get to an A+ in illegibility. There’s less spiky handwriting in the UK than in the US. Like everything else, it’s a class thing (I suspect it is, anyway: italic writing is more ‘upper’ than copperplate). Huh, I didn’t know that that rounded style had a name: “copperplate script”. Just looked it up in WiPe. Is there a “spikey script” ? Italic doesn’t strike me as spikey. Are we talking about three kinds of script here ? I was thinking of copperplate (aka joining-up writing) as being more spiky (when its loops are extended) than italic-derived handwriting, but you’re probably thinking of that German Fraktur stuff as italic – which is indeed very spiky. Hilter’s signature is very spiky, though he turned against Fraktur he didn’t change his signature. I would have asked him about that. Yes, I guess I had that in mind. For some reason I have a belief that old ladies used to have a spikey, spidery handwriting. I may have got that from novels, Dickens say, because I don’t think I have ever been in handwritten correspondence with an old lady. Old ladies educated in the late 19C certainly used copperplate. I think. I have no evidence. Do I know any shouting lesbians ? It’s just part of the cliché. Some people I know are convinced that just because I’m gay, I must secretly put on leather pants and go out to dance in the streets during Christopher Street Day. I thought it was Germans and Austrians who wear leather pants, though perhaps not so much in secret. I’m a bit deaf, so I’ve nothing against anyone shouting. I was working in Munich in September. Many men put on their leather pants, many women their aprony, bosomy traditional dress outfits. The older men are drunk up to the eyebrows, and walk around carefully like compulsive zombies avoiding cracks in the pavement. That’s Oktoberfest. Why don’t you show us a sample of your handwriting? There must be a national thing about handwriting. It’s not strange to find many similarities in people’s handwriting from the same country. I’m all for it. How can he do it? You just want to sic a graphologist on me. <simpers> Well, allright, I’ll go fax a handwriting sample to myself (it arrives electronically in my fax mailbox), transform it into JPEG and try to post it here. But everybody else has to do the same. I’ll do it, but I might have to stick them in a new post. I don’t see how to set pictures in the comments (though it may be possible). I didn’t know faxes still existed. I’m not very knowledgeable about what’s going on in the business world these days. Surely Crown writes like this. I write kind of like that on working drawings, with a chisel point so you get thin verticals and fat horizontals. It took me a long time to learn, my pencil used to slide around on the mylar sheets. I was SHOCKED when I moved back to Europe that most European architects don’t know that technique. Isaac Newton had meticulous handwriting. No doubt Ø writes like this, and uses sepia ink. ohh! How I want to write like an architect! I always loved the way they write. I still have fax machine, though we use it mostly as an answering machine. I’ll send my sample when Mr. Crown tell us where. Like Stu my handwriting could confirm how … peculiar (?) ;-) I am. otherwise spammer software will get aholt of it by scanning. At least I used to see people taking that precaution. For all I actually know, it may just be a superstitious belief by now – they can always get to you if they try hard enough. Here’s a good Hockney article from today’s Guardian. As for his appearance, he should fix himself up a bit. Hockney now works in a huge warehouse on a Bridlington industrial estate that can accommodate work varying from the large to the enormous. So big is the floor area that he has bought a fleet of wheelchairs for him and his team to scuttle around on. Wheelchairs ?? Just because he needs a wheelchair, everybody else has to use one too ? Perhaps they mean upholstered recliner chairs mounted on live crabs (because of the scuttling). Or maybe even bathing machines pulled around by harnessed teams of cute rescue swimmers – I would like to see that. À propos of Hockney’s dig in the direction of Hirst: for me, the fame of famous people is primarily useful as a piece of litmus paper. “A is famous” means everybody knows A, so I can apply the A-test to divide everybody into two groups: those who like A, and those who don’t. Just think: when A is Hirst, I can save a lot of precious time by avoiding the acquaintance of people who like what he does.